As GHX CEO Bruce Johnson wrote in his blog post a few weeks ago, we achieved our $5 billion goal on August 25, four months ahead of schedule. We tracked those savings with a calculator, validated by PRTM (now part of PwC), using metrics that measure the degree of automation, data accuracy and discrepancy reduction achieved by the providers and suppliers that utilize GHX to transact business with one another. Those metrics remain valid and part of our overall calculations, as healthcare must continue to improve operational efficiencies. By the way, did you see the news this week that US hospitals have the highest administrative spending costs? If that’s not a call for taking waste out of the supply chain, I don’t know what is. But as healthcare is evolving and we begin to realize the value of accurate data beyond discrepancy reduction, it will be important to ensure those metrics are added to the equation. 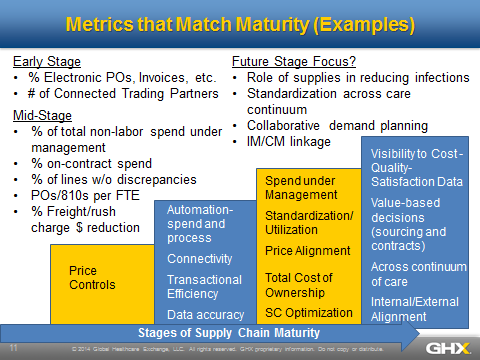 I’ve been talking to some of my GHX colleagues, and to some of the industry leaders in the world of supply chain optimization (organizations like Intermountain Healthcare and Denver Health) and we are beginning to develop some ideas for metrics we can measure today, and those we must in the future. All of which will require access to good, accurate and timely data in a format that can be understood and consumed, by people and technology. Clearly, some of the metrics we have been using as an industry are out of touch with where healthcare is going. For example, in a world where we need to treat people outside of the acute care setting as much as possible, metrics like “supply cost per adjusted patient day” will become increasingly irrelevant. Some of the leading practices around CAUTI and HAPU published by AHRMM’s CQO Movement have also shown us that sometimes when supply costs go up, infection rates go down, and in turn, reimbursement should go up (or at least not drop as much). Specifically, check out the case study and leading practices from the University of Virginia Health System. So how do we develop metrics that matter for the healthcare supply chain? One thing I have learned working with GHX and the myriad providers and suppliers that participate in the network, there is power and intelligence in our community and value in crowdsourcing. So, at the risk of sharing something I have only begun to develop, below is a graphic (be kind, I am a word person, not an artist) of how those performance metrics have changed over the years, and where that focus may need to shift in the future. As GHX continues to evolve and enhance its value metrics, we’d love to hear how you are measuring your supply chain performance, so we can continue to help provide you with good, accurate and timely data to support your efforts.